Confirm that the contractor has liability insurance. This is important on so many levels. If a worker gets injured while on the job in your home, you will not be held responsible. Insurance will also cover any damages to your home, or if anything in your home is stolen. 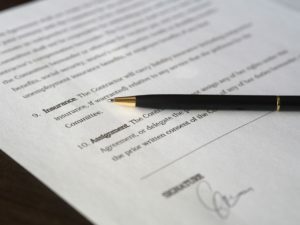 It’s a big mistake not to get a detailed written contract before signing off on work to begin in your home. The scope of work should be provided in detail, covering it all: Cabinet grade, style of trim package, how many electric outlets, type of hardware, grade and color of the paint—everything detail should be covered. And be sure the contract also spells out terms of payment. Ideally, you’ll make progressive payments that are scheduled throughout the duration of the project. If the contractor asks that you put down 50% before works begins, that should be a red flag. Most homeowners will get quotes from two or three contractors, which is a great idea because it helps you get a baseline read on general costs within your market. If there is one contractor that is significantly less than the others, beware. If the contractors are following the same scope of work and using the same grade of finishes and materials, then the quotes should be in the same range. At Dover, we include a lot on the front end so there are no hidden costs and no surprises. Make sure you review quotes in detail, because in the end, you get what you pay for. If the contractor tells you that he/she can start next week, that should be a warning sign. Why don’t they have work scheduled? You can’t get permits turned in one week or source the quality materials that you need on short notice. Good contractors are going to be scheduling at least 4-8 weeks out. While you may be satisfied with the contractor’s quality and capability, make sure to ask about the important details. How will change orders be handled? Who will be your contact once work begins? What are the project start and completion dates? What time will crews arrive and end work each day? With more questions answered on the front end, you’ll feel more comfortable when work begins because you’ll already know what to expect. Do your homework, be thorough—and always follow you gut instinct. There are a lot of great contractors out there. You’re bound to find the right one by putting in some extra time and effort.